Among the various kinds of clothes and apparels worn by men, suits are the most common wear all over the globe. Men have been wearing suits from times unknown and their varieties and styles are changing each and every day. Designers are offering great cuts and fits in the suits section that make men look smarter and more dignified. Although there are innumerable types of suits available at the stores for modern men, there are some individuals who like the vintage and traditional look. One such style that gained popularity in the 1940s was the Pachuco suits. The name comes from a rebellious group in Los Angeles. The style dates back to the time of the Second World War when America was involved in the war. It was rather a second generation of Americans of Mexico who were prevalent in the eastern part of Los Angeles. Pachuco Suits are the Zoot Suits worn by the members of this rebellious group. The suit consists of trousers and a jacket that have certain special features. The trousers come in a baggy design and have a tapered ankle. It has a high waist while the legs are quite wide. The coat or the jacket goes down to the knee, has wide lapels and the padded shoulders are wide to give a broadened look and extra comfort. They are available in a variety of colors like black, brown and other darker shades. This type of attire was mostly worn by the Italian Americans, African Americans, Puerto Ricans, Filipinos and Mexican Americans. They often belonged to the infamous band and had their hair done in the pompadour styles. The greaser styles of the 1950s were greatly influenced by these Zoot suits. 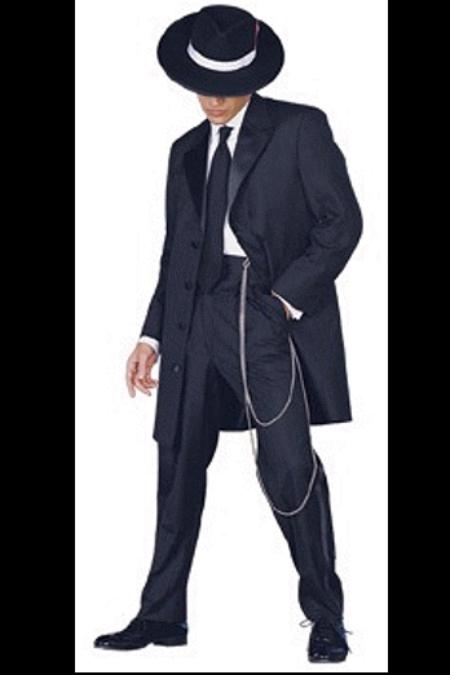 Today also this designer suit is amazingly popular among fashionable men. The increase in the manufacturing of the Pachuco suits started in late 1990s. The style was updated that gave the classic design a new dimension and a new meaning. Nearly every fashion conscious man keeps one of its kinds in his wardrobe to wear it on special occasions and memorable events. You will find an array of such suits at the renowned outlets. You will get them in a variety of bold colors and the fabrics used to stitch these suits are of the finest qualities. Unique designs and workmanship make the apparels so outstanding and decent. There are various manufacturers of Pachuco Suits who offer a huge collection of bold colors. The high grade materials and exquisite hand finishing give these suits a different look. The eye-glass pockets are the specialty of the suits. If you are planning to include this classic designer suit into your collection, check out our online store that have a good stock of these outfits. You will get an idea of the different sizes and colors that are in fashion now and also the price range. However, do not get carried away by discounts or sale. You cannot compromise on the fabrics of this stylish suit. The best cut and fit is naturally a bit expensive. But you can rest assured that they are the best and the originality in the design is maintained. Each product has its own style and dignity which cannot be achieved with cheap materials. Check on the stitches especially around the cuffs and pockets. So get the best cut and fit and surely the quality Pachuco suits and get satisfaction for the money spent on the garment.